In spite of the frigid temps, we packed a lot in this month! Check out all the stories and events that happened in January in this month’s COMPAS News Round-Up. No winter gear required. COMPAS made a big move this month to a new home! Through all the packing and sorting we’ve finally settled into our updated space located at 475 Cleveland Ave North, Suite 222, Saint Paul, MN 55104. Come say hello! Teaching Artists Desdamona, MaLLy, and Frank Sentwali performed spoken-word and poetry this month at the Varsity theater! It was a full house at the classic Minneapolis music venue and a chance for some incredibly talented performers to showcase their work. Botanical expert and Teaching Artist Sarah Nassif takes Danny Seo of Naturally, Danny Seo on an adventure through Minneapolis to find art in nature — even in the big city, Check out the video here! 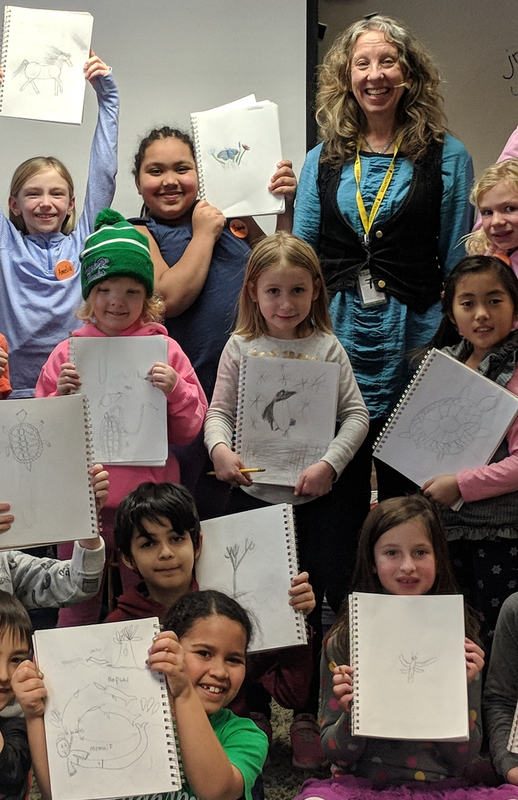 Earlier this winter, Teaching Artist Susan Armington visited Highlands Elementary with colored pencils and paper at the ready for her drawing residency. This month we talked to her about the residency and how drawing as an art form brought new and exciting changes to the students! Read all about in here. Some things to know for January: Minnesota is a frozen tundra, remember to change the year when jotting down the date and of course, it’s Mentorship Month! This month, COMPAS Teaching Artist See More Perspective took some time to write about the importance of mentoring and what it means to him. Check it out here!